The Iranian Regime is overwhelmed by the foreign and domestic crises that it is currently facing, but by far the biggest of those threats is the ongoing nationwide anti-regime protest movement that is being organised by Iranian Resistance group, the People's Mojahedin Organization of Iran (PMOI/MEK). These protests are no doubt the very thing that will bring down the Iranian Regime, so the Regime will likely step up its abuse of the MEK and its supporters inside and outside of Iran. One of the Regime’s typical methods for attacking the MEK are demonization campaigns run by the Iranian Ministry of Intelligence and Security (MOIS), whereby the Regime hopes to undercut the MEK’s domestic and international support by smearing them with false allegations, proven lies, and anything that might stick long enough to deter the protests and allow the mullahs to repress them. How does the Regime do this? The Regime does this through a mixture of Regime-operated disinformation outlets that exist solely to discredit the MEK and push the Regime’s agenda, but also through specially selected disinformation agents – sometimes even former MEK activists who are bribed or coerced - who spread these lies across the West with barely any pushback from politicians, reputable media outlets, non-governmental organisations, or the public. That’s why it’s important that you know about it, so that you can spot the lies and call them out. Here, we will tell you the most common lies of the Regime about the MEK and the truth behind them. • The MEK has limited support within Iran: We can tell this is a lie because over 120,000 MEK members have died fighting for a free Iran, hundreds of thousands more have been arrested for MEK membership. At no point does this sound like a group with limited support. Besides, why would the Iranian Regime spend so much money and time to discredit a group with limited support? • The MEK is violent: The MEK is not even armed, having laid down their weapons in 2004 in order to be declared protected persons under the Geneva Convention and remain neutral during the 2003 Gulf War. • The MEK killed American Service Personnel: This has been discredited many times and is in fact merely an example of the Regime blaming their attacks on a convenient scapegoat. • The MEK is Marxist: The MEK in their 10-point plan for a Free Iran outline their support for the Free Market and Capitalism. 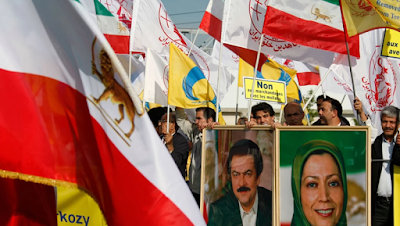 This disinformation comes from a period when all of the MEK’s leadership were imprisoned by the Shah in the late 1970s and a Marxist subset of the group took over and tried to transform the MEK into something it was not. When former MEK leader Massoud Rajavi was released from prison, he righted the MEK and moved it away from Marxist ideologies. Hopefully, this has provided you with a good starting point to challenge the lies spread by the Regime against the MEK and to recognise disinformation campaigns when you see them.